A Wiltshire town that decided to get rid of its speed cameras has the safest roads in Britain, a report has revealed. 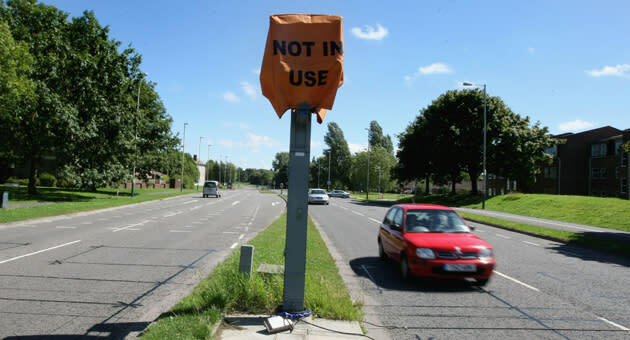 Swindon, which scrapped its speed cameras in July 2009 to save on council costs and trial other traffic calming measures, has just two accidents per thousand registered vehicles on its roads - the lowest rate in the UK. The town became the first English local authority to decommission fixed cameras, although it decided to maintain mobile cameras used by police. In contrast, The City of London – which still uses fixed cameras - has more than 45 times the amount of accidents with 90.9 per thousand registered vehicles involved in prangs. “We are delighted Swindon has come out so well in this research because we take road safety extremely seriously,” a Swindon Borough Council spokesman told Yahoo! News. Swindon saw little change to the number of accidents after the cameras were scrapped, with no fatalities in the six months following their removal. Taxpayers’ Alliance campaign director Emma Boon said: “This is more evidence that speed cameras are not the answer to making Britain’s roads safer. The cameras result in fines that represent a significant burden on drivers on the basis of how fast they are driving on one stretch of road, but we need a broader, more effective approach to road safety policy. “Local authorities should follow Swindon’s example and move to focus on other road safety measures aside from speed”. The research by insurance firm Stavely Head, compiled from Department of Transport figures, reveals that London’s roads are by far the worst for road safety, with 11 of the UK’s most dangerous 15 boroughs in the capital. Nottingham, Manchester, Liverpool, Brighton also feature in the most dangerous road list. “We hope that by revealing the Local Authorities with the highest accident rates, more will be done by local councils to make our roads safer”, said Ashley Peters, Director of Staveley Head.